The double layer premier leather sandal offers all the great features found in our single layer leather, but with an added layer of midsole for more cushion and arch support. 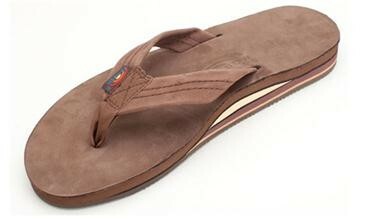 The double layer premier leather sandal offers all the great features found in our single layer leather sandal, but with an added layer of midsole and pin line, which runs from the heel to the front of the arch, for even more comfort and support. The midsole is made to break down 10% under your foot so you have the perfect mold for your individual feet. The top sole is premier nubuck leather, and is embossed with the Rainbow® logo. The premier leather strap is double stitched, and the nylon toe piece is secured with a box X stitch, all sewn with bonded nylon thread. The layers are all triple glued for maximum durability, and rests on our non-slip Rainbow® bottom. This sandal displays the Original Rainbow® woven label on the strap, the mark of a genuine Rainbow® Sandal.